As I write this, Chewie and I are on the banks of Lake Huron in St. Ignace, Michigan, and Jim is flying to a major eastern city to work this week. How did we get from enjoying Wisconsin while Jim worked from the RV to here? Well, I’ll have to leave the work stuff for Jim to share, but let’s just say that quite a bit has happened and a great deal of traveling has occurred since Wednesday of last week. After an exceptionally fun weekend in the Lake Winnebago area last weekend, Jim had some important work projects to complete, and I had to make a quick return to Tennessee to address some family business. Jim, the night owl that he is, probably worked until 1 or 2 a.m. Tuesday night (technically Wednesday morning), and I got up at 3:00 a.m., dressed, and was on the road to the Milwaukee airport by about 3:40 a.m. Routing through Kansas City, I finally made it to Nashville about 12:30 p.m. where my brother retrieved me. We headed out to address the family business stuff that needed to be done. Meanwhile, back in Wisconsin, Jim was wrapping up a contract. He also had a good deal of back and forth going on pertaining to another potential project. With my mind and hands full with the family business, I left Jim to figure out whatever would happen next. I’d find out the results when I got back to Wisconsin. I returned to the RV about 11 p.m. Thursday night. 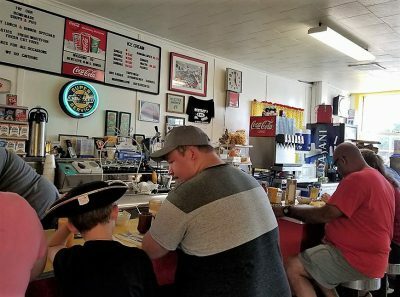 Knowing I’d be exhausted, he extended our stay in Fond du Lac for another night, so Friday, he and I were able to catch up over a brunch at a fantastic locally owned eatery in town, Connie’s Diner. He and I chatted while we watched the owner cook our food. Afterwards, we did some household errands and chores before beginning to prepare to move the next day. My business did not get resolved, so it will be continued at another time; I just don’t know when. Jim, on the other hand, had been a very busy man. I learned that in addition to wrapping up the work on the contract he’d been finishing, late on Thursday, he’d also booked himself a flight to this major eastern city for travel this evening. He starts a new work project tomorrow. That is all I’ll say about that; it is for him to expound upon work when he feels ready and has time to do so. If you’ve checked out our Maps page, there are some plans that we made that had to be changed because of the new work venture and my day of rest. (Thus, the Maps page need updating again, but Jim does that part.) He and I skipped our stop in Marquette, and we drove longer than we normally like to get to St. Ignace, Michigan, in one day. The drive was lovely, so it was not a chore. While still in Wisconsin, we passed one beautiful farm after another. From Green Bay on, the farms became fewer and farther between as we edged along Lake Michigan, finding more and more frequently it was forests on the other side of the road. He and I hardly went 15 minutes without at least a glimpse of this Great Lake. Finally, after exiting Hiawatha National Forest, the views of the lake became more consistent as we neared St Ignace, the town on the Upper Peninsula (UP) side of Mackinac Bridge that connects the UP with the rest of the state of Michigan.The bridge spans over the Straits of Mackinac where Lakes Michigan and Huron join. It is the 5th largest suspension bridge in the world, and we get to drive over its 4-mile span when we leave here. Since we’d skipped our planned stop for Friday and Saturday nights and arrived in town a day early, we needed a plan. The park at which we had reservations for the rest of the week could not accommodate us early. Jim had scanned our options, and we struck out hoping for the best, especially since there is no Wal-Mart anywhere near St. Ignace. We got lucky. The casino run by the Sault Nation, just outside the city limits of St Ignace, has a first-come-first-serve RV Park with electric and water. There were a few sites left when we arrived about 5:30 p.m. on Saturday. We set up, went to register, and paid the $15 camping fee. Then, we needed food. I can’t say the food was good, but it got us through. After a short nap, filling the truck with diesel, and a drive to see how close we were to our campground for the rest of the week, Jim and I returned to the casino. 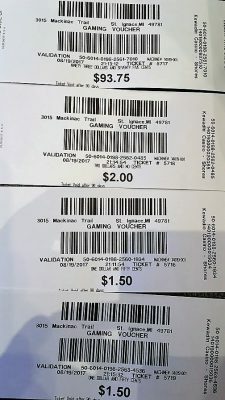 If you’ve read about our other two casino experiences at Indigo Sky in Oklahoma and in Dodge City in Kansas, then you know that we ONLY play whatever free-play money the casino gives to first-time patrons.Such was the case at Kewadin Casino. We received $5 each in free-play money. Jim played first; he won $1 and played it out. He said I jinxed him because I stayed and watched. When I started playing, he left. I won $1.50 on the first quarter played. I always cash out what I win so that I know when I’ve used up all the free-play money. After I had played out my $5, I walked around the casino twice looking for him. Not spying him, I headed to the cashier to cash out before I lost my tickets. It was funny that Jim appeared beside me as the cashier was preparing to count out my winnings of $98.75. That covered our camping fee, dinner, and gave us some extra. 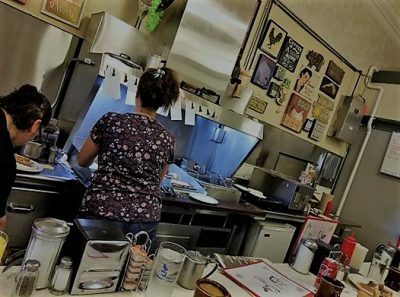 This morning, we came into town to grab breakfast, and we found another winner of a local eatery here: Bentley’s B-M-L Diner. Once again, we waited for our food because the place was busy and food is cooked to order. While we sipped on coffee, we met some really nice folks including a couple from Ohio with whom we enjoyed delightful conversation. Breakfast done, Jim and I went to our campground. The site we were being assigned was already vacated, so we paid our fees and got the RV moved and set up as quickly as we could. Jim had some time to rest before he got into the truck, suitcase and computer bag already packed and loaded, and headed to the airport for his flight. Chewie and I stayed in the campground for most of the rest of the day. I spent the first part of the afternoon trying to arrange campground reservations for after leaving here as we make our way back to Tennessee, a little faster than originally planned. The latter part of the afternoon, I worked on identifying things for Chewie and me (and later Jim and me) to do in the area. Jim will get at least all day Friday to explore with me. Then we’ll be traveling in the RV on weekends until settled in Tennessee while Jim travels by plane during the week.